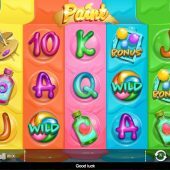 Paint slot is a rare art-themed slot and it has been developed by UK gambling company Iron Dog Studio. From the name of the game to the brightly coloured reels, there is no mistaking the whats on offer here. I like a game that know what its trying to be and Paint is bright, bold and fun. The soundtrack is a light loop of non generic music, which is inoffensive and fitting of the game. So will Paint leave an positive impression on our bankroll? This is a 5 reel slot with 3 rows and 20 fixed paylines. It’s almost a carbon copy of Neon Jungle, in terms of pays for picture and card symbols. 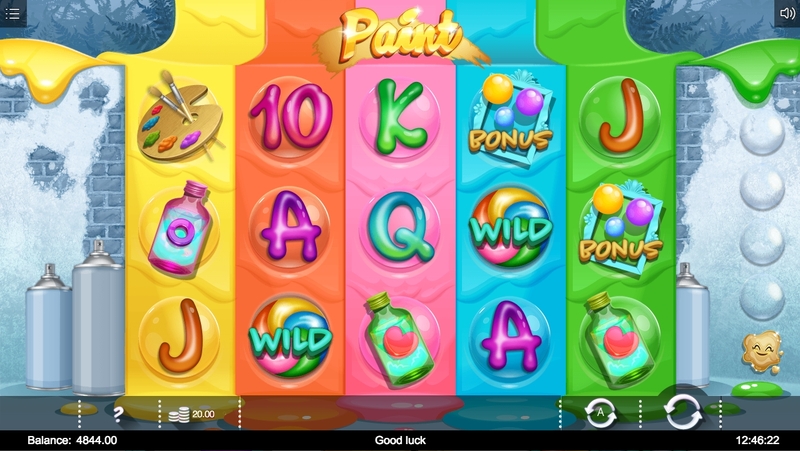 Top paying symbols is the pink paint bottle, rewarding 100x your stake for 5-of-a-kind. However, don’t expect to see this too often. There are lower paying symbols including other paint bottles and an artists palette and the card symbols A-K-Q-J-10. The colour spiral Wild will replace all symbols except the bonus and Paint Splash. This is triggered with 3 or more bonus symbols on consecutive reels. You will then be presented with a choice of balloons that you get to pop. As you work through you will get a multiplier under each balloon, until you choose end feature. There are also extra coin bonuses to accompany these additions during the feature. All credit to Iron Dog Studio for coming up with a very original theme with Paint slot. It feels a bit of a mash up of Gifts of Ostara and Neon Jungle, but it has its own originality as well. The 95.8% RTP is very much expected for this developer and I would consider this slot medium volatility. Paint slot has some artistic flair and offers something quite different, but it falls short of being a masterpiece.